After stumbling across a website of a restaurant in New York that served this dish, I was curious to try some for myself. I googled the recipe and to my dismay, could not find any. I did see that this dish was served in Africa, and aside from that-no traces could be found. I decided to make my own version, using deliciously fresh Oxtail, in place of traditional pork. Toss the oxtail in 1/2 cup soy sauce along with the 3 seasonings. Marinade at least 1 hour or overnight. Preheat over to broil on high. Spread the oxtails on a grease-lined baking sheet and broil until lightly browned. Transfer to a crockpot pot on high. Add 1 cup beef stock and let simmer 4 hours (until the meat falls off the bone easily). Remove from crockpot and drain liquid. Shred the meat from the bone and place in a bowl with the teriyaki sauce and ginger juice. In a wok over high heat, add some of the sesame oil and the chopped onion. Saute until the onion is translucent and sweet to the taste. Remove from heat. Add a little more sesame oil. When hot, add 2 eggs and scramble until cooked. Set aside. In the hot skillet, add the remaining sesame oil and soy sauce. Toss in the rice, stirring constantly, The pan should be hot and bits of the rice should begin to brown. At this time add the chopped ginger, scallions and frozen edamame. Toss in optional vegetables if desired. Quickly add the chopped egg, onions & oxtail back into the pan and mix thoroughly. Remove and place in a serving dish. 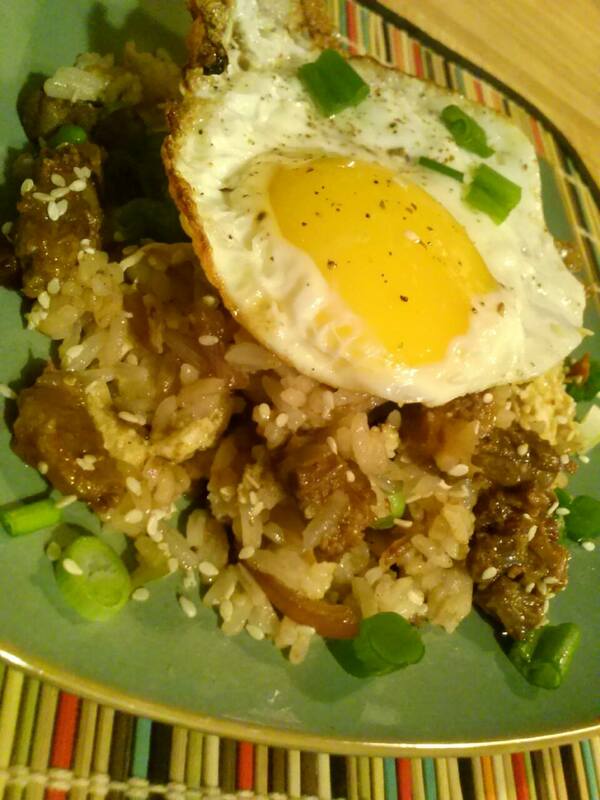 For each serving, prepare a sunny side up egg in the hot wok and serve over the plate of rice. Add sesame seeds and more chopped scallion to garnish.